Mrs. Selfish and I have always been market people. Perhaps it’s the energy of the fruit merchants hawking cheap oranges, or the allure of handmade wares, or (more likely) the tiny restaurants and shops selling artisanal food. 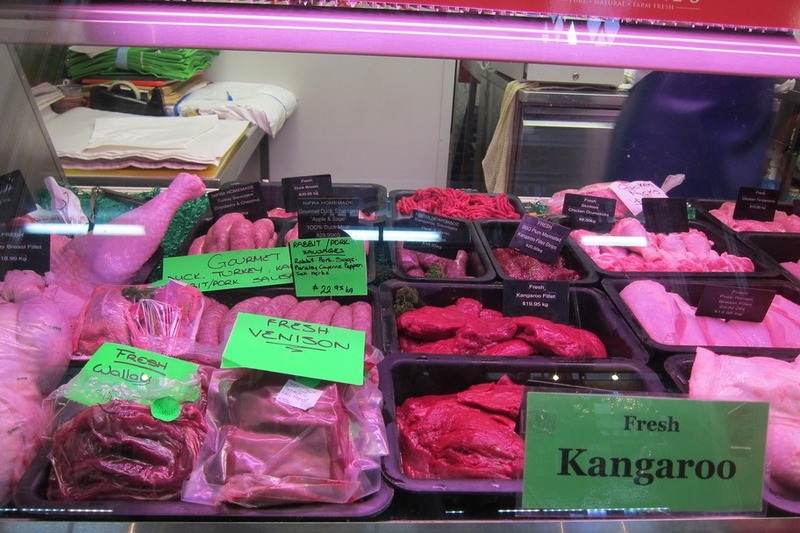 Having visited Sydney’s markets, and missed Hobart’s Salamanca market we were determined to visit Melbourne’s Queen Victoria Market. 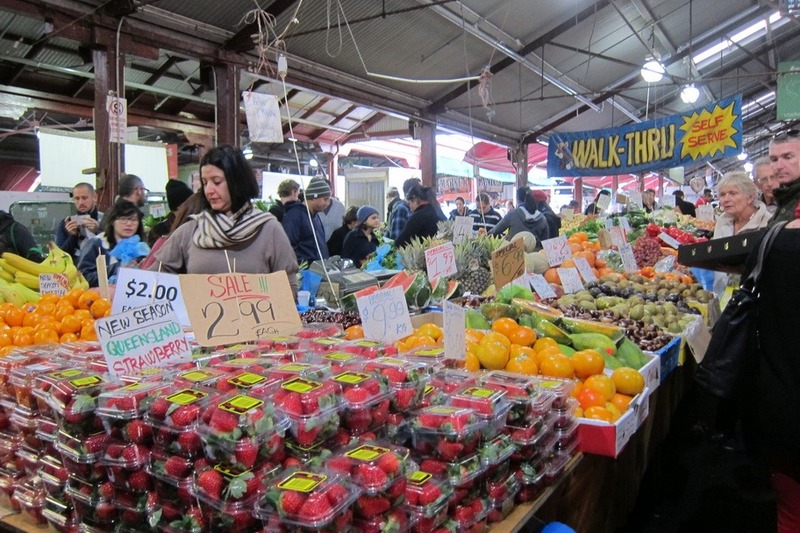 Set near the central part of Melbourne, Queen Victoria Market is open 4 days a week, with the exception of Monday and Wednesday. 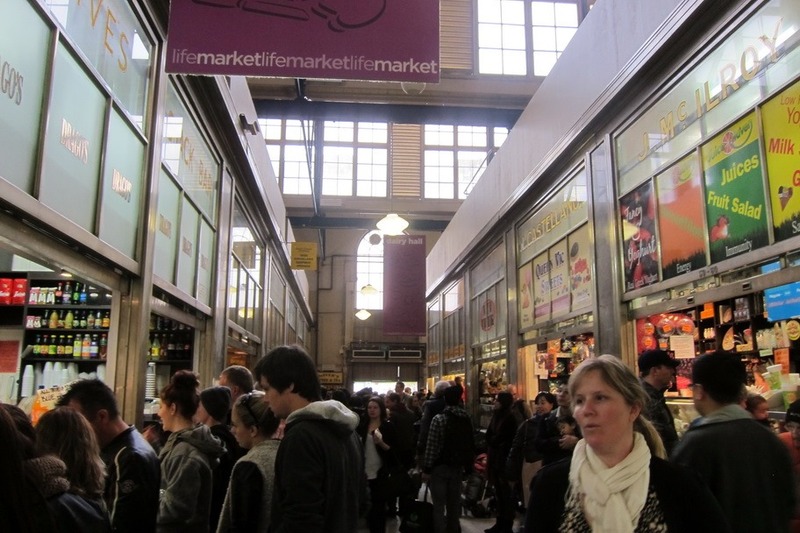 I was immediately reminded of Philedephia’s Reading Terminal Market or Seattles Pike’s Place – albeit a much larger version. 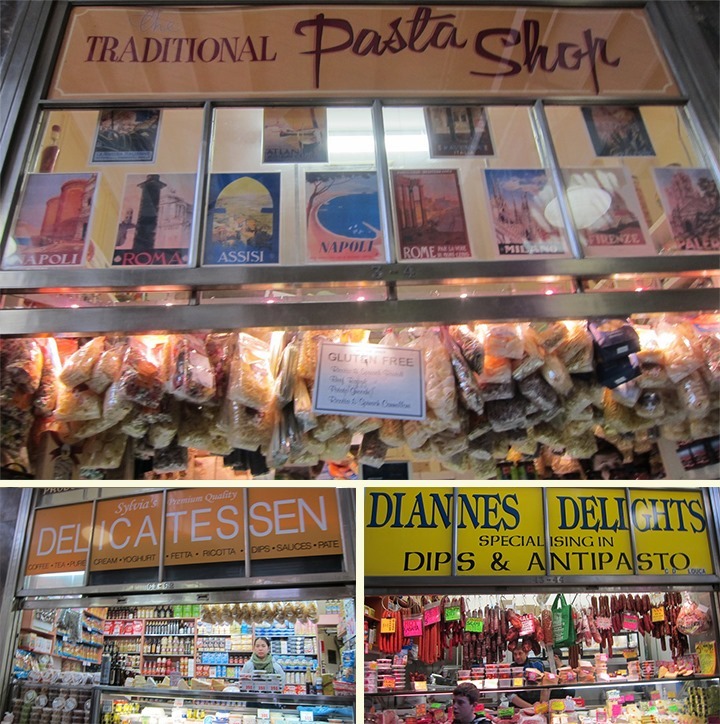 The market is split into three sections: delis & bakeries, produce, and general merchandise. 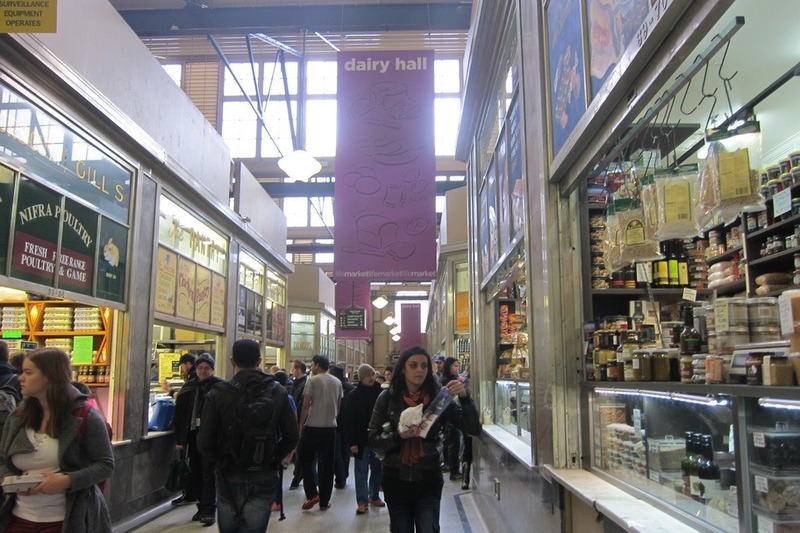 Since we arrived for lunch, our first stop was the market’s deli area. 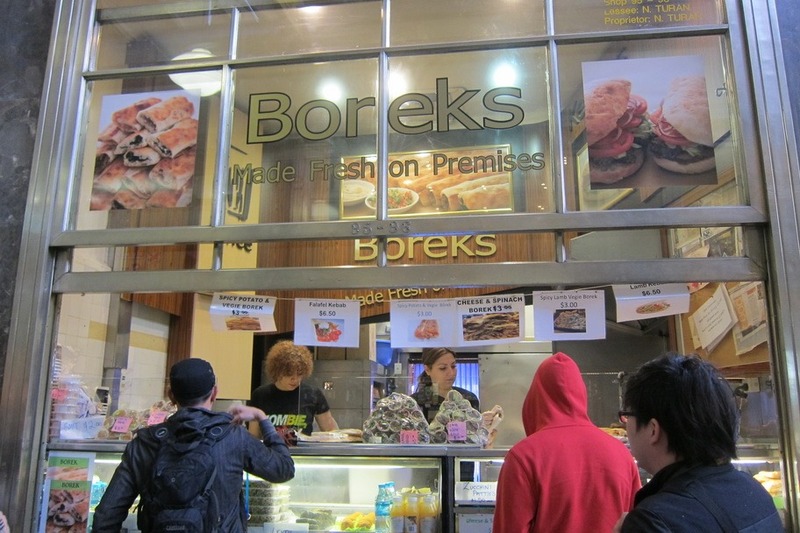 Two eateries stood out: a deli selling bratwurst sausages, and a borek stand – both had large crowds and a fast turn-over rate – a sure indication of great cheap eats. 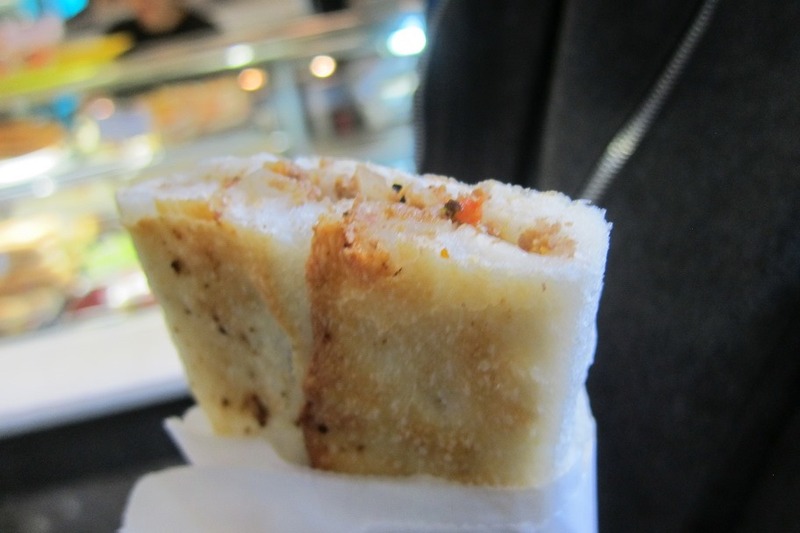 The borek was hot and fresh, with a slightly crunchy texture and a nice blend of savory and sour flavors. It was devoured instantly. 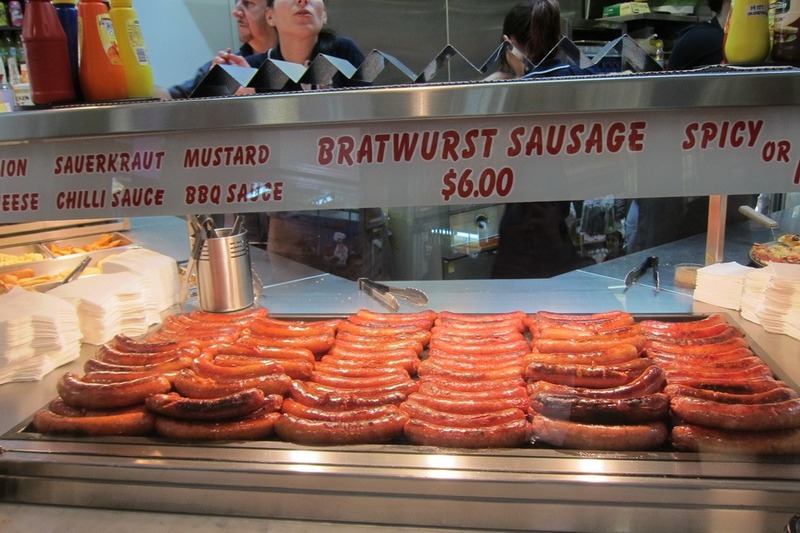 The spicy bratwurst sandwich was the tastiest I’ve ever had – easily besting the ones I tried in Berlin and Munich. 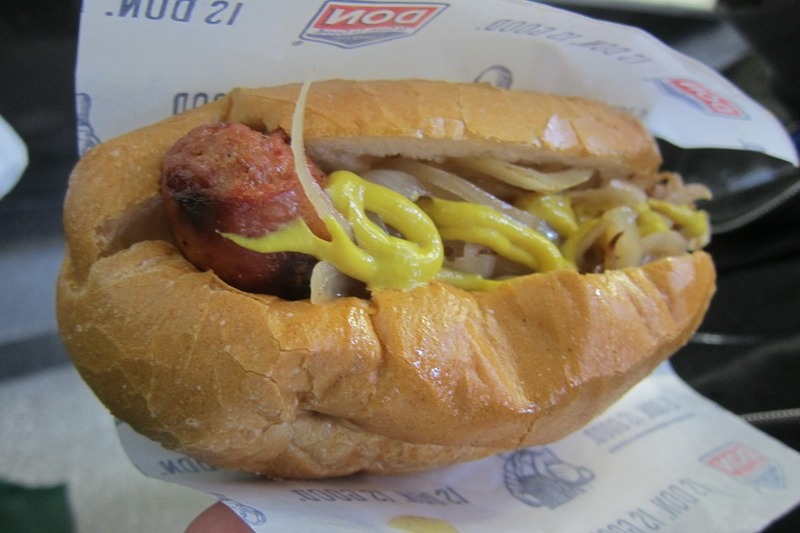 The sauerkraut was nicely pickled, and the sausage was spicy and pleasantly salty, without overpowering the kraut or the onions. The bread added texture, while lingering nicely in the background. Since we were renting in an apartment, Mrs. Selfish and I also picked up some ingredients for cooking: fresh peppercorn & cayenne pasta, and thai-style chicken sausages. Yum! 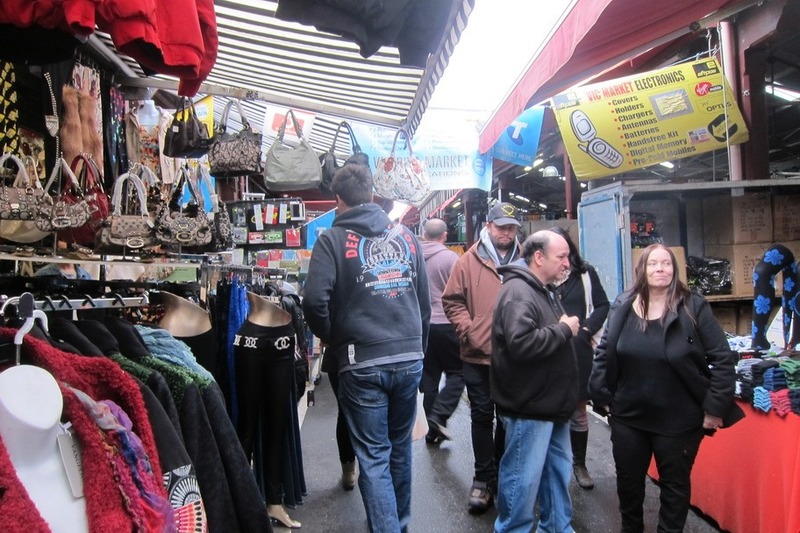 We then headed to the back of the market, which was full of merchants selling sunglasses and basic clothing items. 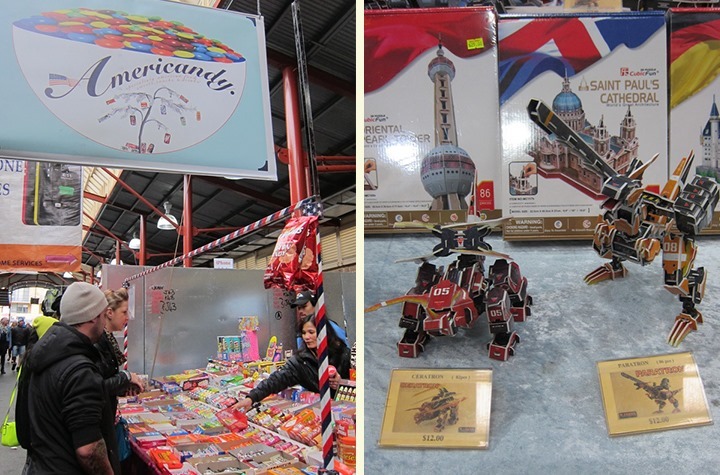 If you’re looking for a place to pick up decent souvenirs, Victoria Market has a nice mix of the expected and the unique. 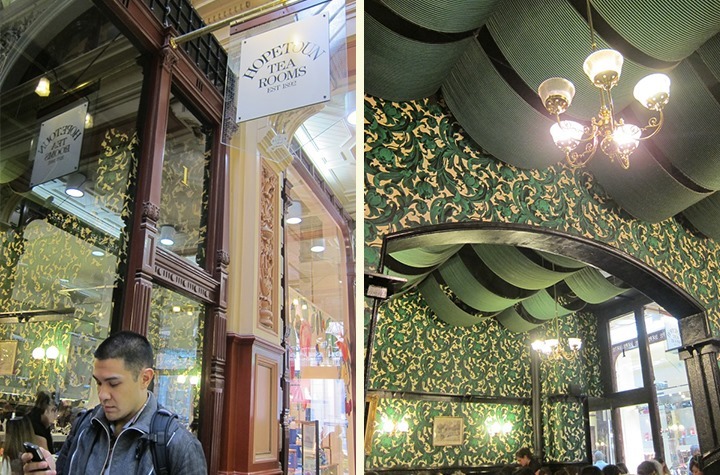 Next, Mrs. Selfish and I headed for the Block Arcade, an old-Victorian styled building which was now home to an upscale shopping arcade. While the building was lovely (and probably worth a visit in its own right) we were there to try the high tea at the Hopetoun Tea Room. Mrs. Selfish and I have a weakness for high tea. 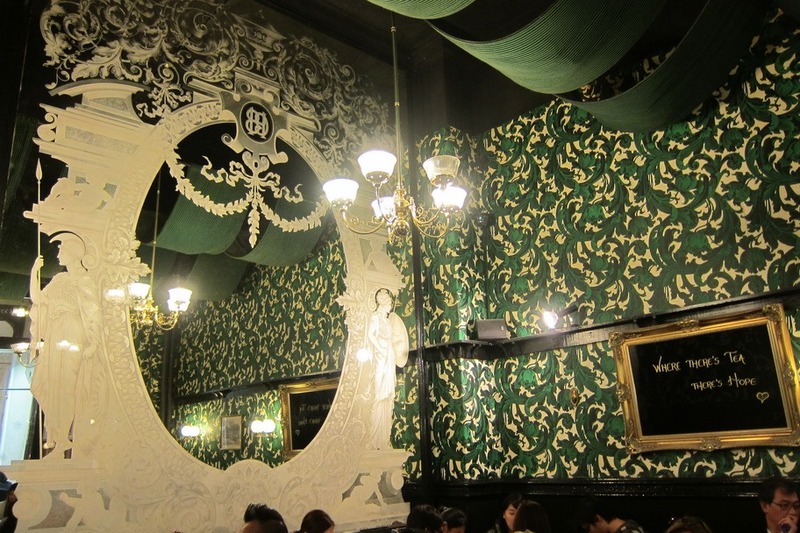 While a little pricy, I find the food and atmosphere usually make up for the general stuffiness. I enjoyed the Balmarol Hotel in Edinburgh, loved the pomp and circumstance of the Ritz & Penninsula in Shanghai , and marveled at the food in Sydney’s sparse tea room in the Queen Victoria Building. 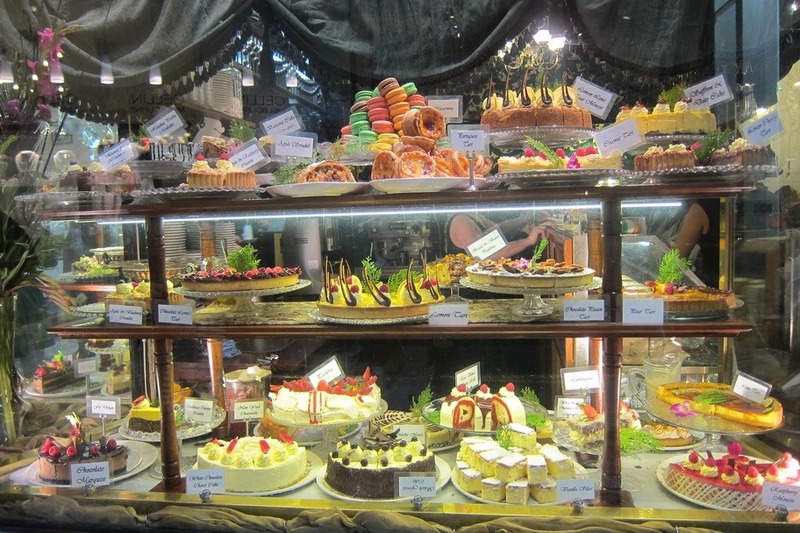 The Hopetoun tea room is certainly no exception here – the food and atsmophere are excellent. Hopetoun Tea Rooms is extremely popular, so if you’re interested in getting high tea here, I’d suggest making reservations online several weeks ahead of time. Mrs. Selfish tried just a few days before our arrival in Melbourne, and it was already booked up! Slightly disappointed, we decided to order a pot of tea and some items off of the lunch menu. We ordered the duck confit salad, scones, and a pecan and chocolate tart. 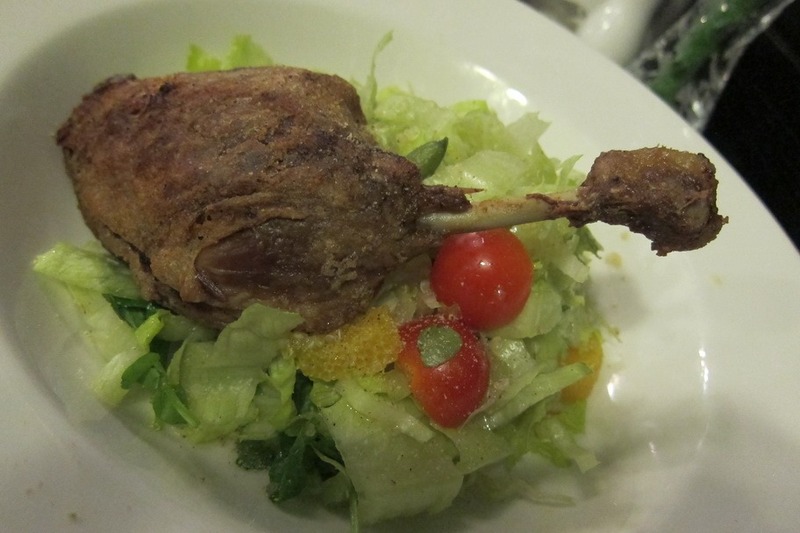 The duck confit salad was excellent, and better than some of the duck confit we experienced in Paris. 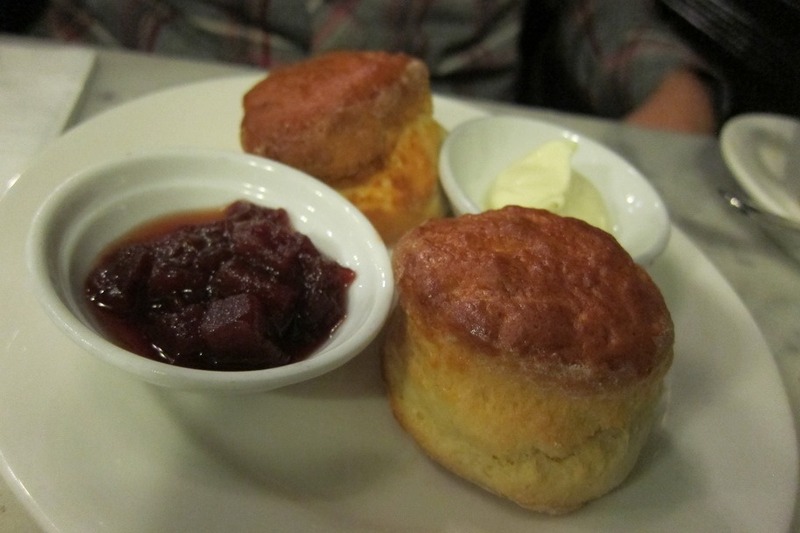 The scones were good, but lacked the flavor and crunch of their English contemporaries. 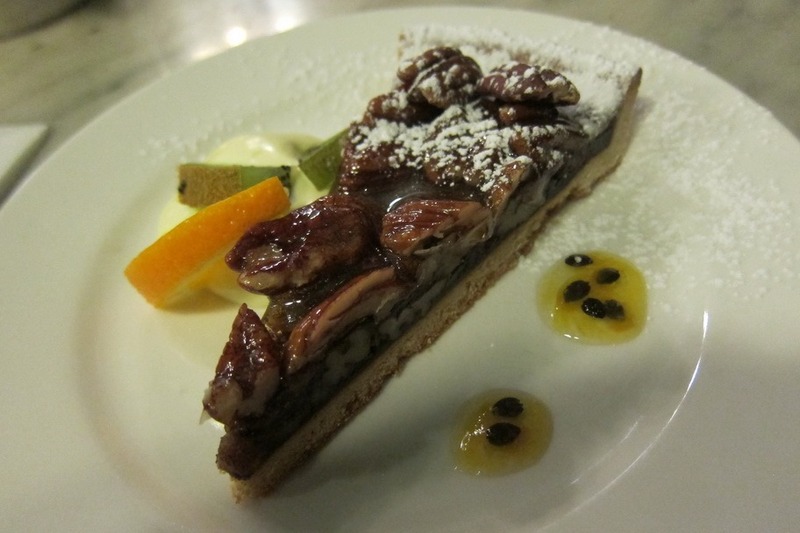 The pecan & chocolate tart, however, was spectacular. Unfortunately where the food was excellent, the service was not. 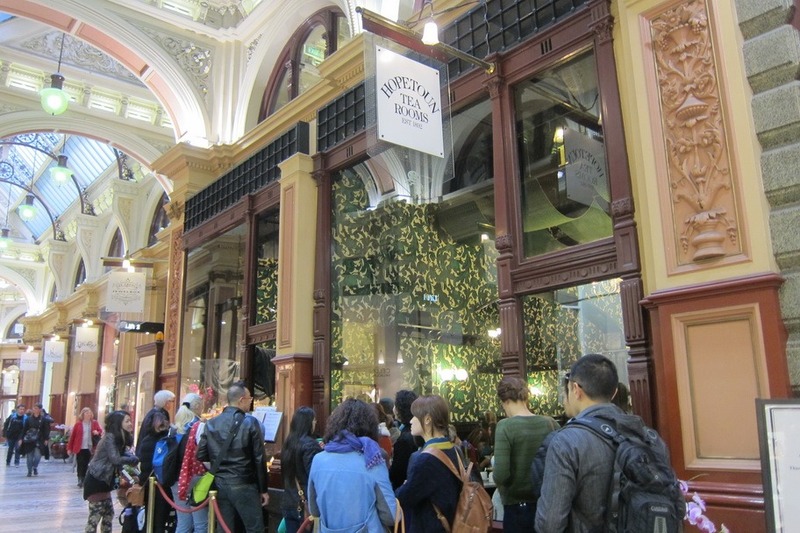 The staff on the whole seemed overly rushed, and refused us glasses of ice water and extra hot water for my pot of tea. While I understand that the restaurant gets pretty busy, it seemed completely contrary to the nature of a tea room. VERDICT: While the food was excellent, the rudeness of the staff and overall rushed feeling of the meal was not. If you don’t care about lousy service and only care about the food, make reservations several weeks ahead of time. If not, I’d recommend trying somewhere else. Hey guys, I am really sorry about the service you received. My wife, who is Japanese, complains about the service in Australia often, and I can’t really blame her. Hope you still had a great time in Aus. Yeah no worries, it just took a little getting used to. 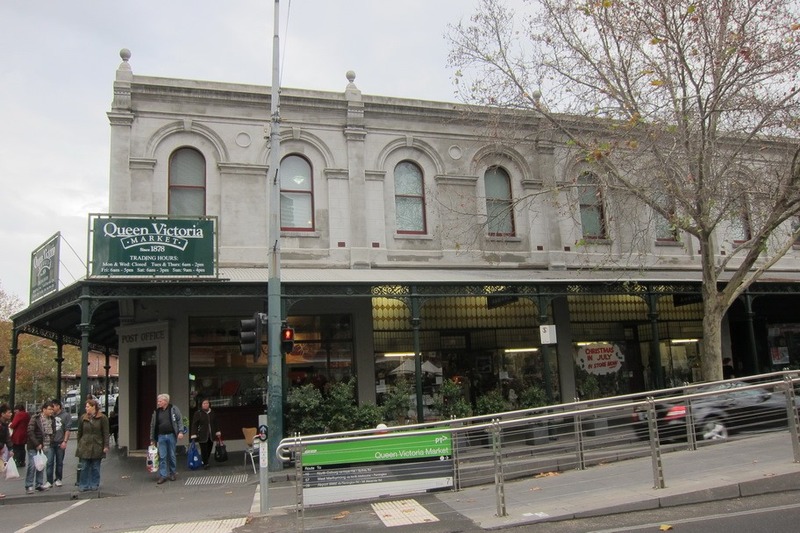 The tea room in Melbourne was the only place it really became an issue – otherwise I was a huge fan of OZ’s water jug approach.